Do the Present, surrender to the moment dispassionately and throw out all concepts. The good stuff happens in the mundane. The Tao of the Kung is a CD by Paul Grigsby. It is based on the note, middle F, a fourth above middle C. This note also corresponds to the Heart Chakra vibration. It is often referred to as the F-Tone. But this CD is really about being comfortable in the present moment . Check it out at cdbaby. It just may take you to a place where you don't deal with time or sound the way you might normally. Think about sunlight shining on the crest of a waterfall; always constant, always changing. Slow down and see instead of looking and hear instead of listening, while you work at nothing. There is no beat to this piece, just a cadence. after listening to the ocean I noticed waves come in cycles and sometimes appear to keep time and other times break meter and just change things up. Once in a while you might hear a triplet or 6/8 for a few bars when you listen to the naturally occuring music of life and that includes sounds that don't seem even remotely related. The Tao of the Kung helps you into the overal soundscape you experience every day with seemingly unrelated sounds like cars, people talking, laughing, a random dog barking or a car horn honking, all that stuff makes up a well constructed symphony if you don't focus on it or anything for that matter, and you'll get into the groove with things and join with the music. You may want to experiment with the volume and bring it up into the natural noises occuring around you until it sounds about like everything else. Turn up the Tao of the Kung so it's about the same volume as the ambient sounds around you. When you get it "tuned in", it will appear that the sounds of the Tao of the Kung and the sounds around you seem to come from the same place and share a common cadence. The Tao of the Kung opens a door into that world of cadence and harmony as it relaxes your spirit and brings you into harmony within the moment. The Tao of the Kung is also pretty good when you're doing yoga or enrgy work. The F-Tone note is middle "F" above middle "C" on the piano, (698Hz). It has been referred to as the "tonic of nature". The Voice of the Silence by H. P. Blavatsky says: "The Northern Buddhists, and all Chinamen, in fact, find in the deep roar of some of the great and sacred rivers the key-note of Nature. Hence the simile. (Middle F, the "F-Tone", is the note associated with the 4th, green, heart chakra). "It is a well-known fact in Physical Science, as well as in Occultism, that the aggregate sound of Nature-such as heard in the roar of great rivers, the noise produced by the waving tops of trees in large forests, or that of a city heard at a distance -- is a definite single tone of quite an appreciable pitch". This is shown by physicists and musicians. Professor Rice (Chinese Music) shows that the Chinese recognized the fact thousands of years ago by saying that "the waters of the Hoang-ho rushing by, intoned the kung" called "the great tone" or "the great emptiness" in Chinese music; and he shows this tone corresponding with the F, "considered by modern physicists to be the actual tonic of Nature." Also mentioned in "Principles of Physics", saying that "this tone is held to be the middle F of the piano; which may, therefore, be considered the key-note of Nature" Middle F is also the tone of the Green, Heart Chakra. The F-Tone can be used as a mantra. Listen to the tone. When you notice you aren't listening to it, go back to it and listen some more. Before long you will become aware of it for longer intervals with the ability to allow thought to pass downstream as you give them all up. The Tao of the Kung in contrast to the F Tone, combines with the other noises of the day to create an orchestrated experience of the moment. There is a natural timing in all sounds that is not always easy to feel. Tao of the Kung helps you into that space. Some vibrations go unnoticed, like subsonic vibrations and supersonic vibrations as well. B-Flat is a a fourth or fifth of F and for the last 10 million years or so it has been playing that B flat out of the event horizon of a black hole in the Perseus galaxy at sufficient volume to be detected from Earth. It bellows b-flat "57 octaves below middle C". Those vibrations are creating extremely intense heat, power great enough to escape the black hole, that's some serious tone! If you listen closely to the Tao of the Kung you will notice the B-flat presence throughout. It resolves to the "F" but the b-flat comes in and out against the constant middle f undertone. 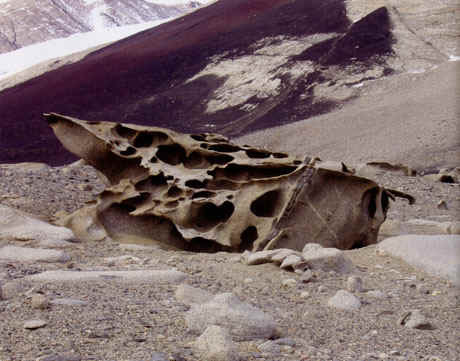 The B-Flat Mountain Range in Antarctica also plays b-flat through its fluted, wind eroded mountain rocks. "The multi-directional winds in this eerie and isolated wasteland create ventifacts of an exceptional nature, gouged with pits and decorated with flowing flutes and arching curves." 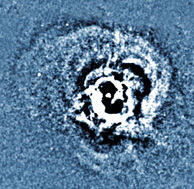 A Black Hole in the Perseus Galaxy and the B-Flat, Antarctic Mountain Range vibrate in harmony with the F-Tone. The black hole has been vibrating 57 octaves below B flat for millions of years. Imagine the soundwaves that can escape a black hole. The picture below, on the right shows the "flutes" that have been cut into the rocks of the B Flat Range by millions of years of winds. The one on the left is the event horizon of the black hole.